The place kickers and punters in a football game can become heroes or goats in an instant. Just look at the fate of the NFL kickers this past Sunday and how many kicks missed their mark. It is not easy being a football kicker. The pressure and conditions can all take a toll on the psyche of any kicker. Last Friday night the weather in Brodheadsville for Pleasant Valley was terrible. It was raining steadily and the wind was whipping. Consider this: being a high school kicker is hard enough in good conditions let alone these terrible conditions! 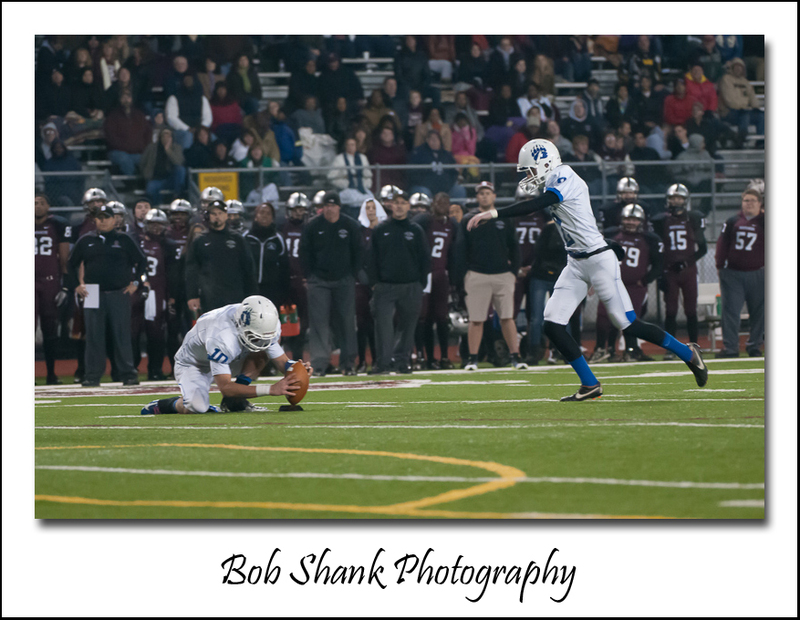 Photographing a kicker can be equally frustrating! A lot of action happens on every place kick, punt, and kickoff. 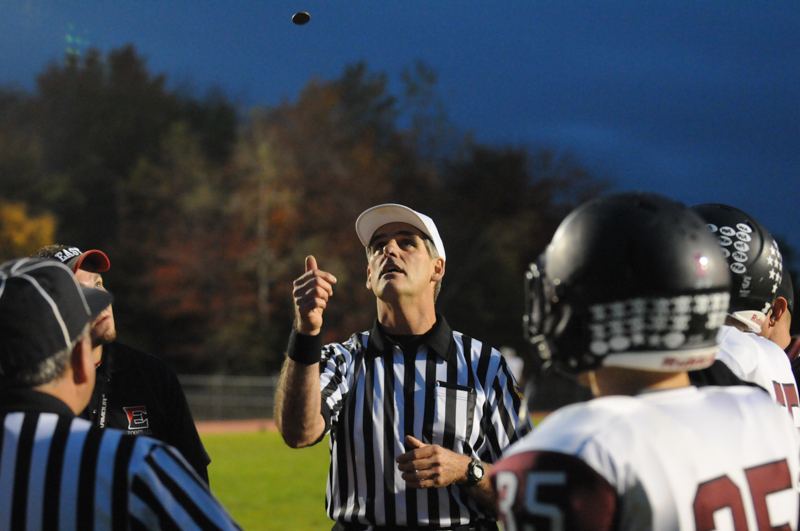 Players and referees appear all over the field and oftentimes right in front of the kicker! Timing is imperative, too. I think of capturing the kickers during the game as a game within the game for us sports photographers. 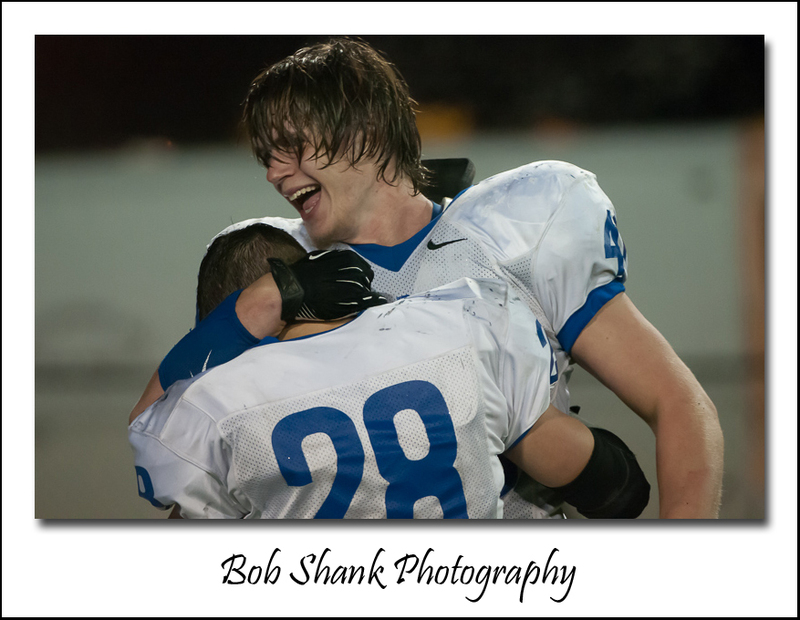 Newspapers, magazines, and news wires want the touchdown scores and sometimes the celebrations after the score. But then, immediately after all this exciting action, is the point after attempt. We need to get into the proper location right away or we will completely miss the extra point attempt. 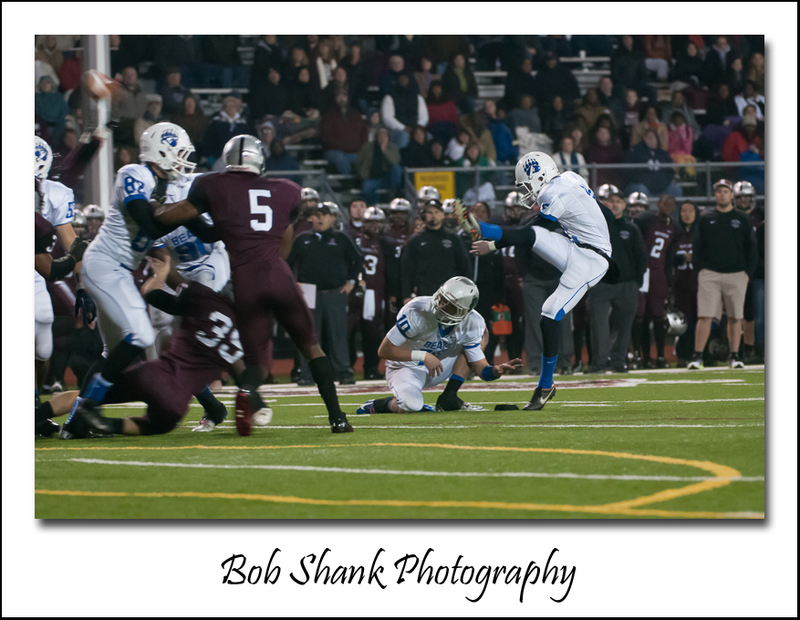 Here is one more of my favorite shots I captured of a high school kicker. Kickers do not have it easy and yet win many games! It was an exciting opener in Stroudsburg, that’s for sure! 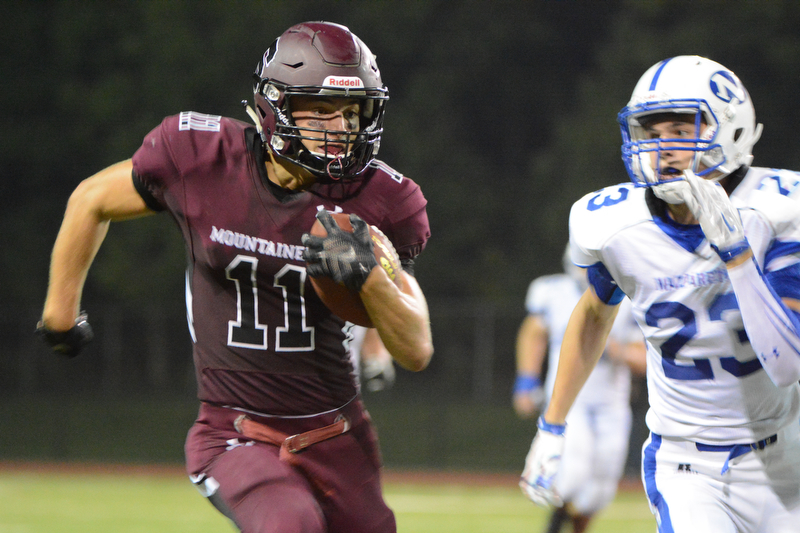 The Mounties hosted the Nazareth Eagles on a hot and muggy night as the opening high school football season got under way. 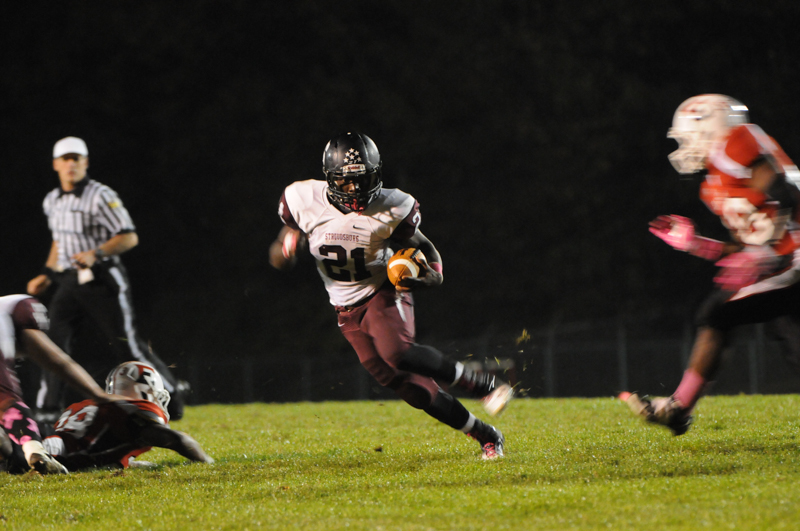 An interception returned for a TD by Nazareth opened the scoring and then Stroudsburg immediately responded with a kickoff return in what would be a final score of 49-47. It felt good to be on the field again as the season opened and these two teams put their best effort on the field. All the hard work of summer camp paid off splendidly. Big plays, speed, and grit & determination were displayed by both teams. 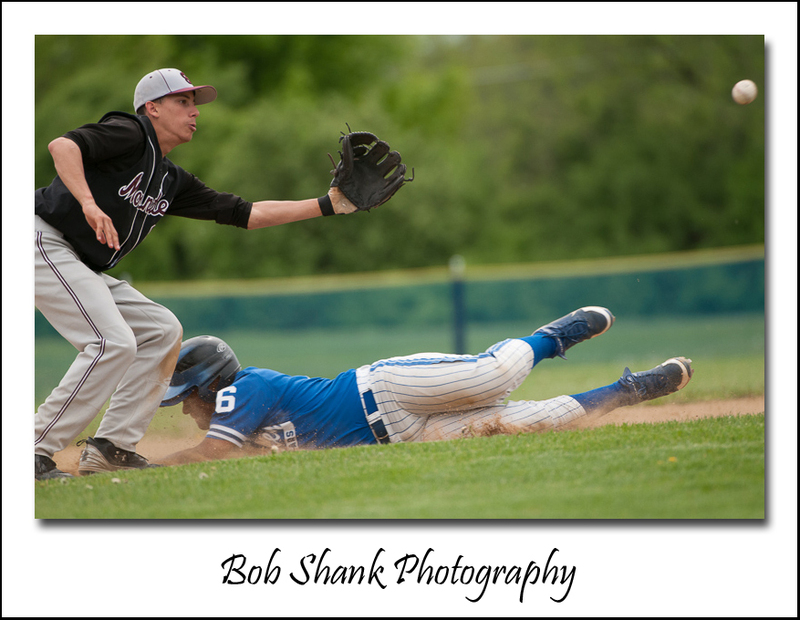 Shortstop, Danny Hrbek, turns an unassisted double play in the early innings of this rematch. 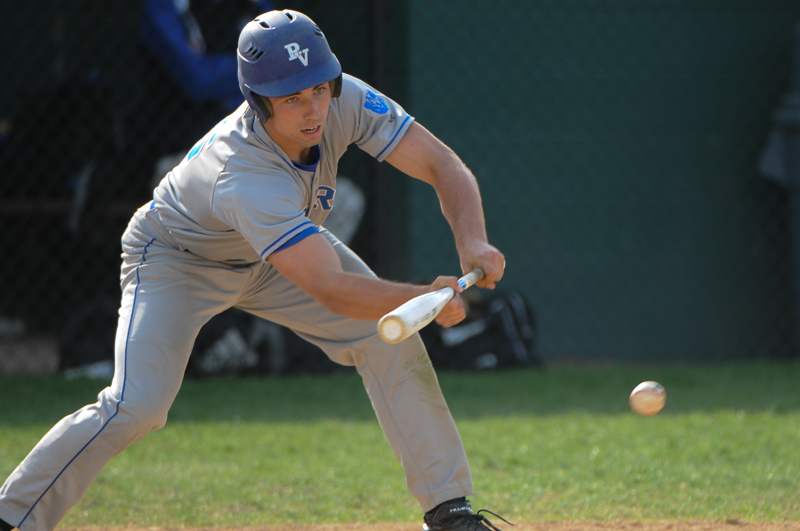 Pleasant Valley hosted Stroudsburg in a rematch of an earlier season game that went eight innings. This important game played up to the hype and went nine innings! It was another nip and tuck game for both sides and showed just how evenly matched these teams really are on the diamond. The game started an hour earlier due to impending rain that was predicted to be on the way. The weather storms held off, but the thunder of bats driving balls deep kept the fans on the edge of their seats throughout this thrilling game. 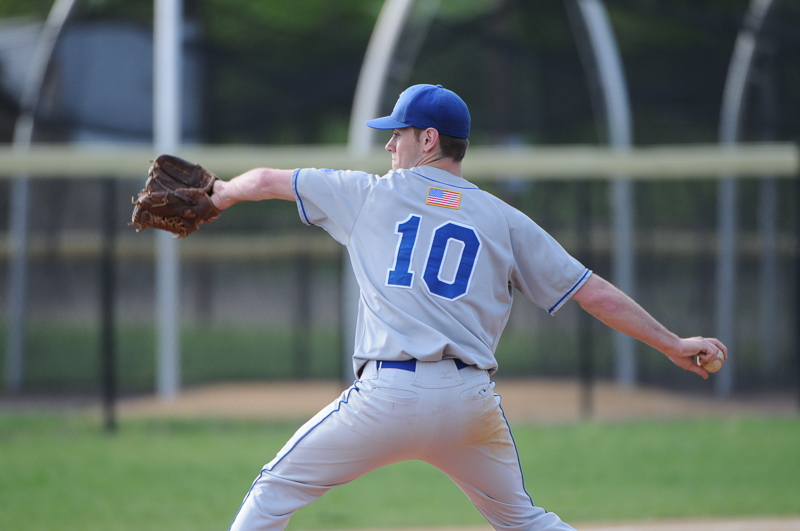 Dylan Pasnak pitched a masterful game against Stroudsburg tonight. He was locating pitches, and started out ahead in the counts. 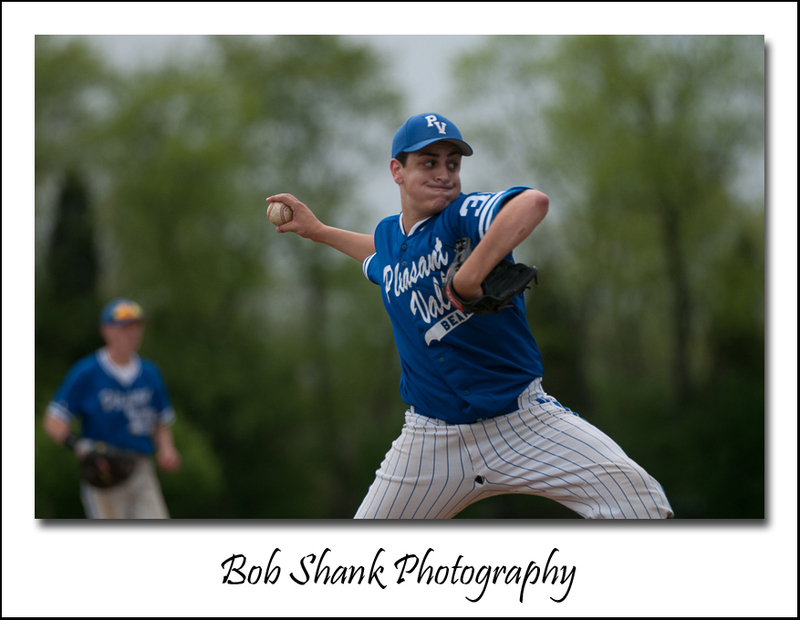 It was arguably the best game he put on the mound all season! Dylan Pasnak pitched a masterful game. He gave up two, first inning runs on three hits. After the game he said the mound was not in great shape at the beginning of the game and it was throwing his stride off a little bit. He fought through it and got stronger as the game progressed. His fastball seemed to actually get faster with each passing inning! His pitches resulted in a lot of ground balls. Some hits went deep into the outfield, but the outfielders did an excellent job tracking them down, including one incredible diving catch by center fielder Troy Van Houten in the top of the fifth inning! Ariel Mejia slides into second base on a successful steal attempt. There were times when PV was aggressive on the base paths. Ariel Mejia stole second base, and on another play, Dan Hrbek stole third base and Adam Raseley followed behind to steal second base on a beautiful double steal! This is something PV will have to do more of in the Semi-Final game against Pocono Mountain East in their bid to get to the MVC Championship Game again this year. They are on track and sitting well going into next week’s MVC Championship Games. 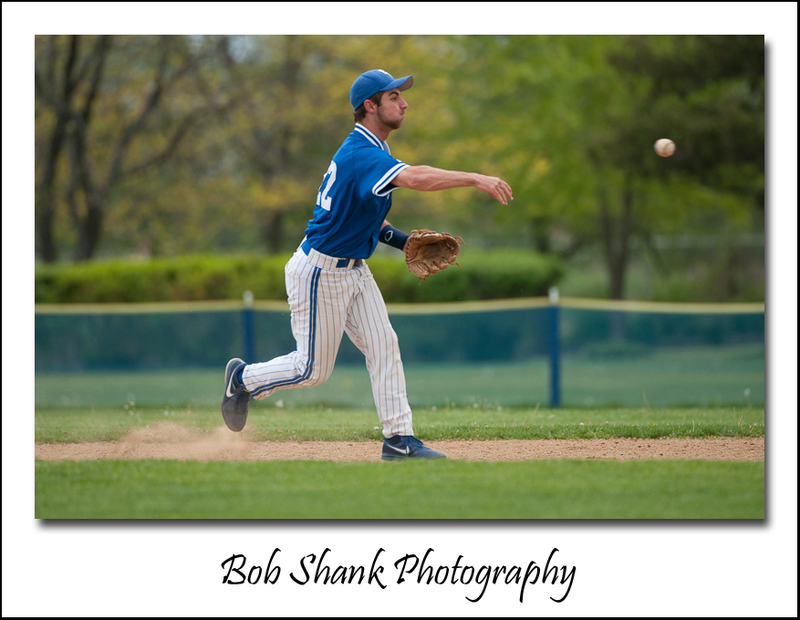 Second baseman, Austin Yoffredo, records the put out by throwing to first base. 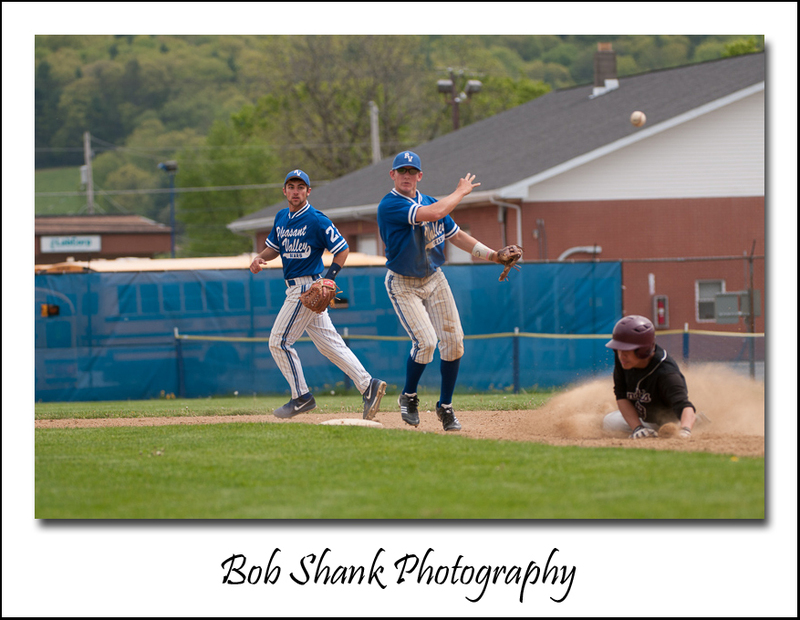 There were a large number of ground outs in this game. 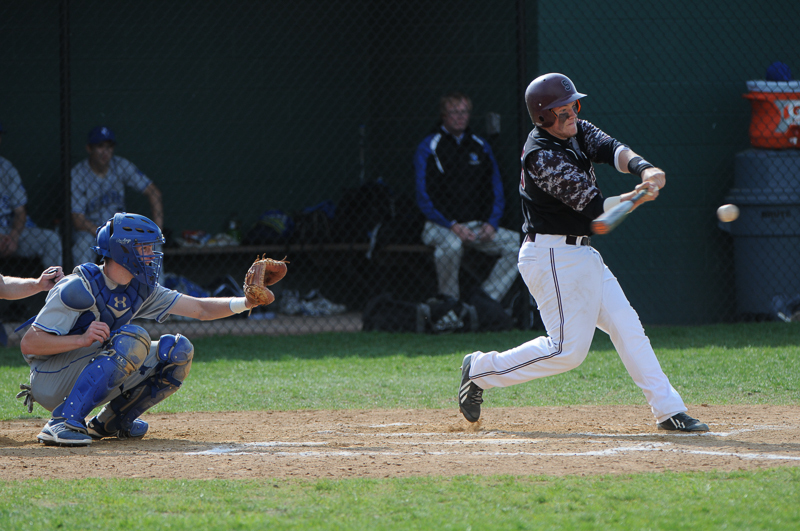 Joey Deperno, the Stroudsburg starting pitcher, did well on the mound. He commanded most of his pitches and pitched deep into the game, only being taken out in the 8th inning after he threw 117 pitches. Dylan Pasnak was able to pitch deep into the game, too, thanks to the ground outs, which kept his pitch count just over 100 as well, topping out at 107 pitches thrown. It was a close game between these two teams and even position by position. 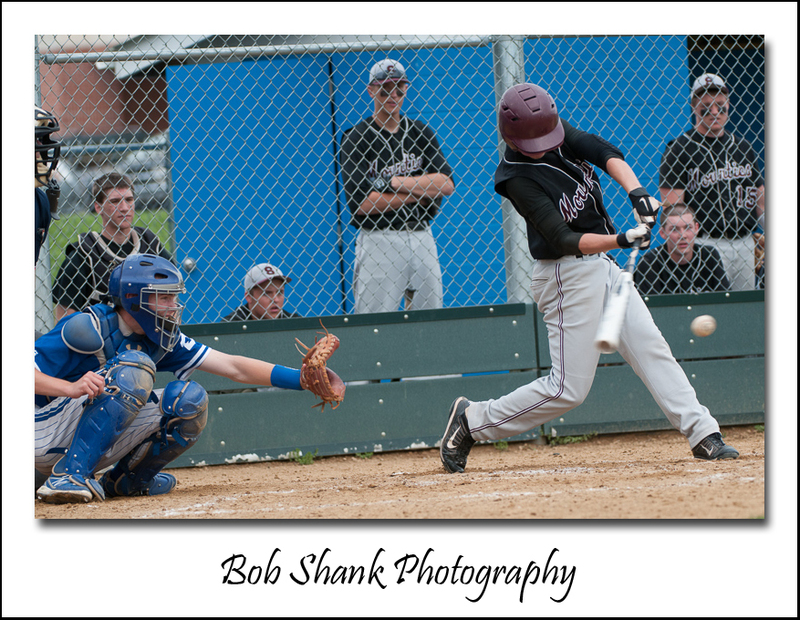 Catcher, James Shank, is ready to receive the pitch, but the Stroudsburg hitter has other plans! This game went into extra innings, knotted up 3 to 3. 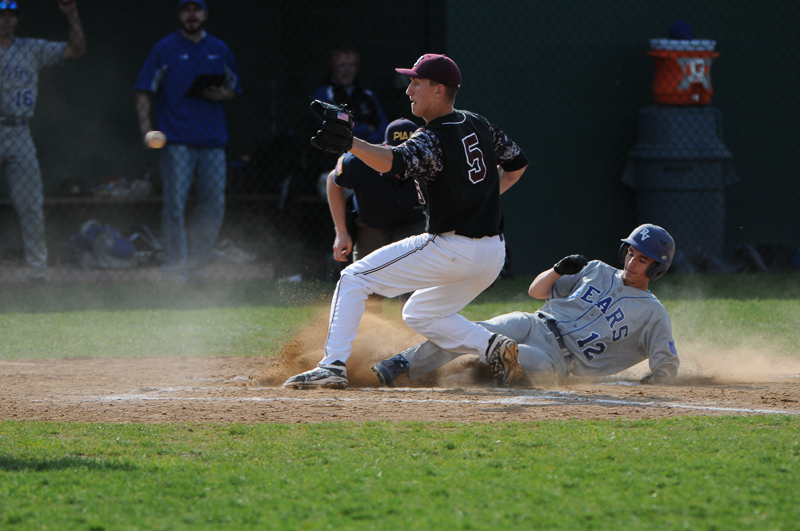 It took nine innings to determine the outcome when Stroudsburg crossed a runner over the plate on an error. That’s how close this game was and how evenly matched these teams are on the field. 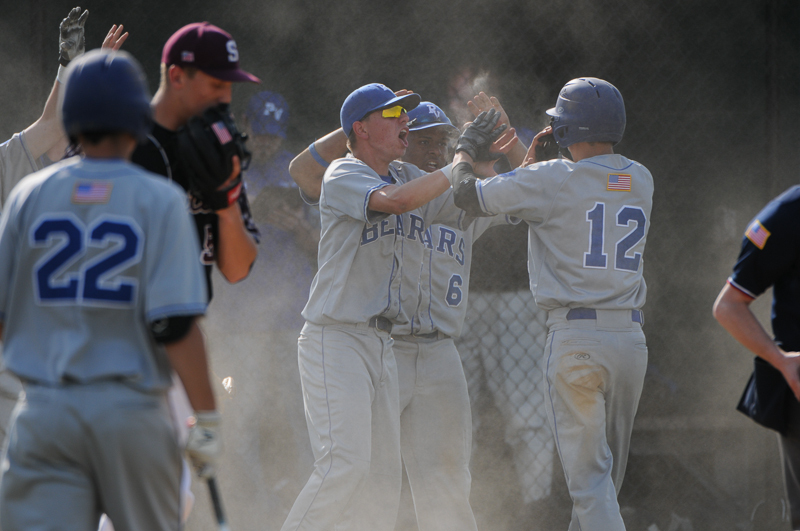 In the two regular-season games, they were each decided by one run in extra innings! 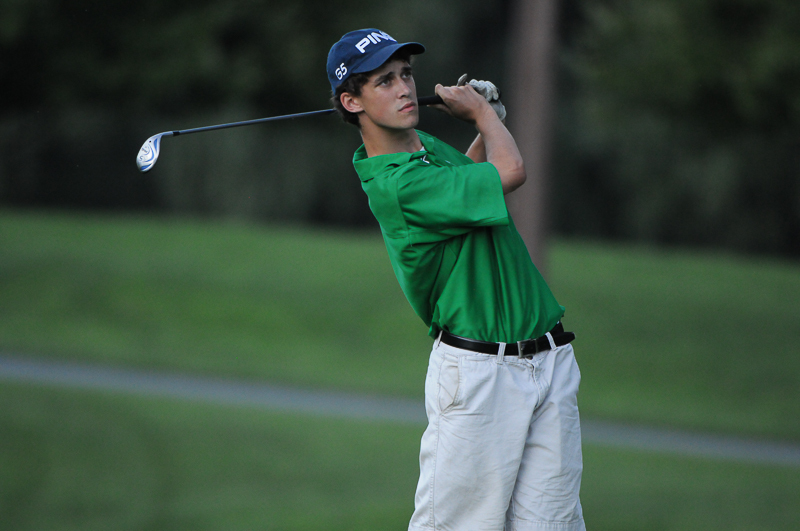 The regular season is winding down as PV faces Whitehall tomorrow. Then the MVC Finals will be played next week. 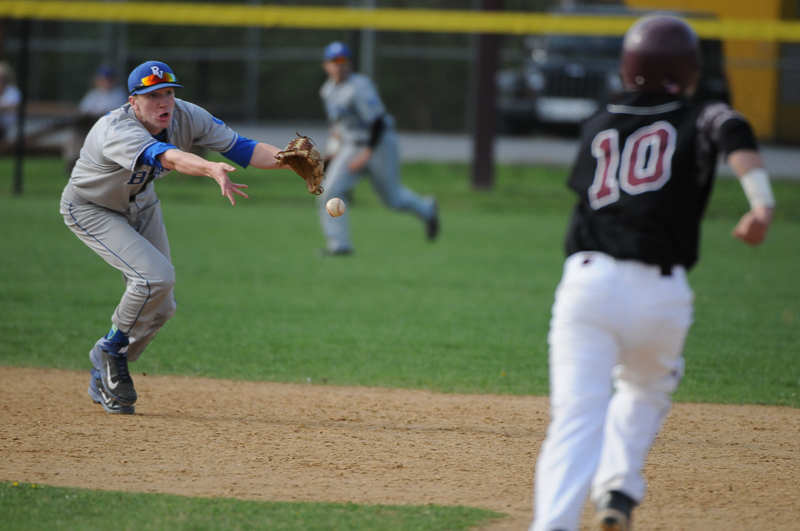 It was a rematch from a week before–Pleasant Valley vs. Stroudsburg, and it was a thriller! 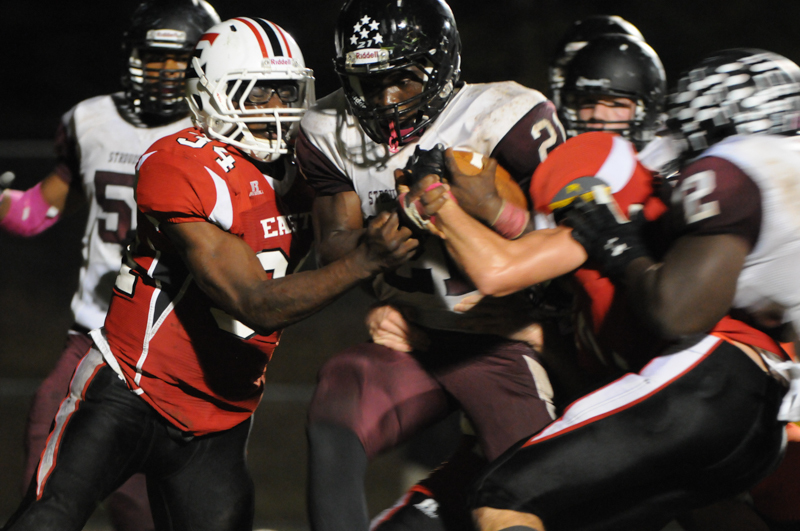 As sometimes happens, all the hard-fought battles came down to a few huge plays. 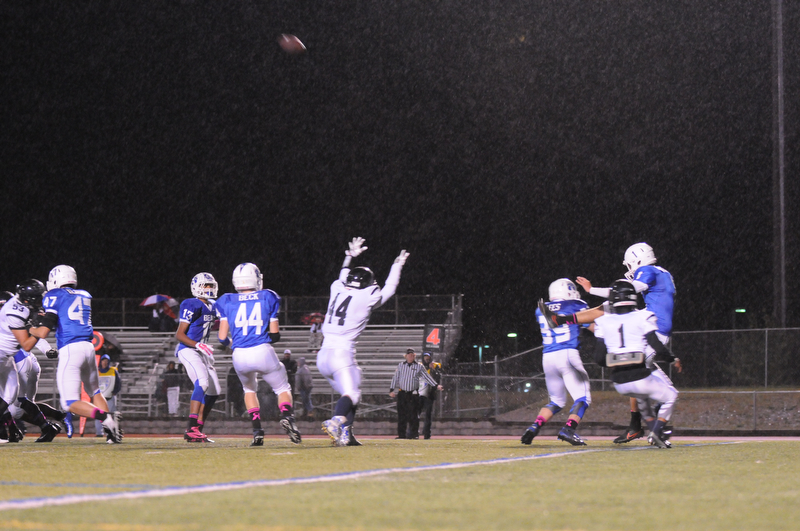 A flea flicker, a field goal, and an interception were the big plays as PV fought to victory on Saturday night. It was a game for the ages! The first big play of the game didn’t take long to develop. 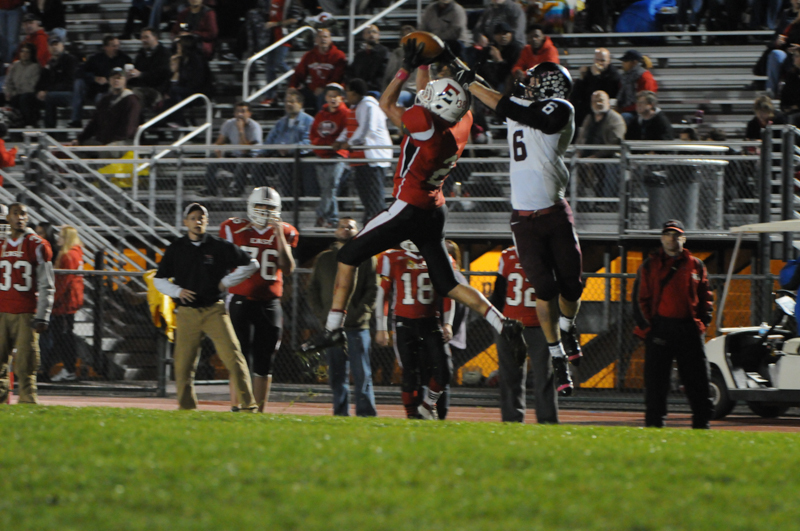 A flea flicker put the ball back in Leap’s hands and he threw a bomb to his receiver, Romeo. So began the rematch and subsequent plays would not disappoint. 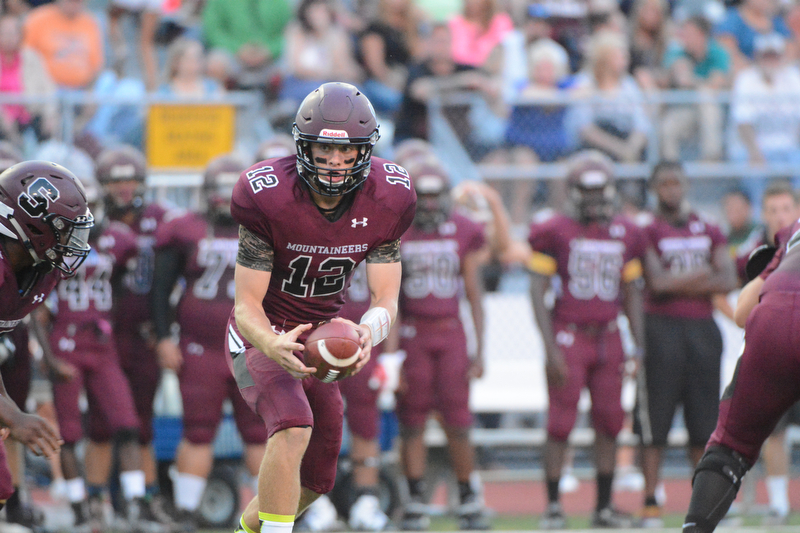 PV scored three touchdowns in the 1st half, which was reminiscent of the previous week’s game when Stroudsburg did the same. 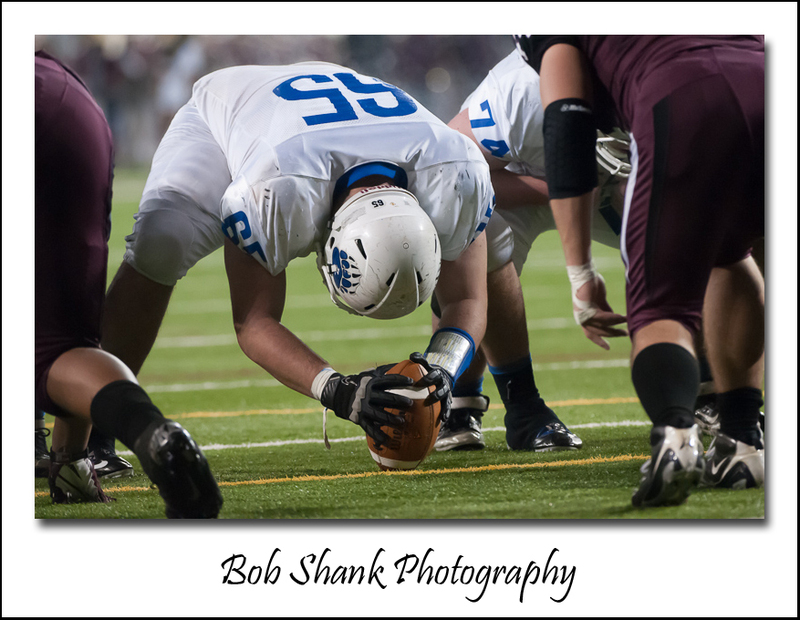 The battle was fought out in the trenches on the line of scrimmage. This is typical from two well-matched teams, but few fans ever notice the battles fought here. Most watch the quarterback, running backs, and receivers, as they focus on the ball. But without these battles being won, the big plays would never develop. 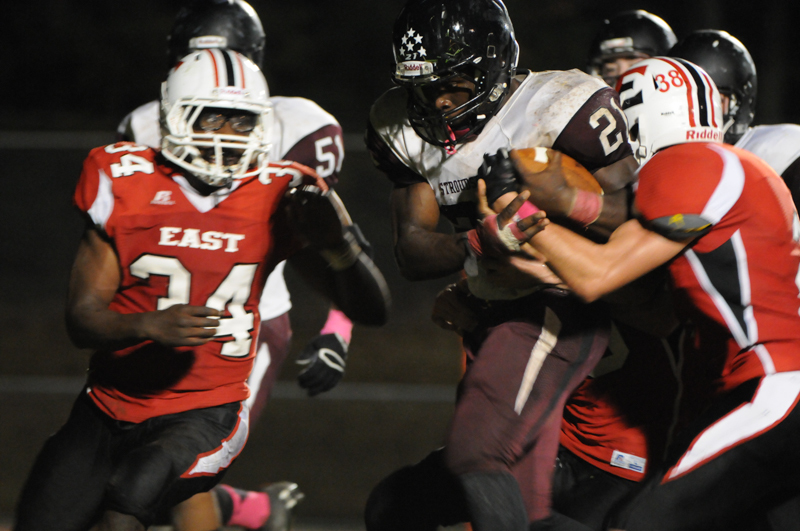 Stroudsburg fought back twice to eventually tie the game at 21. 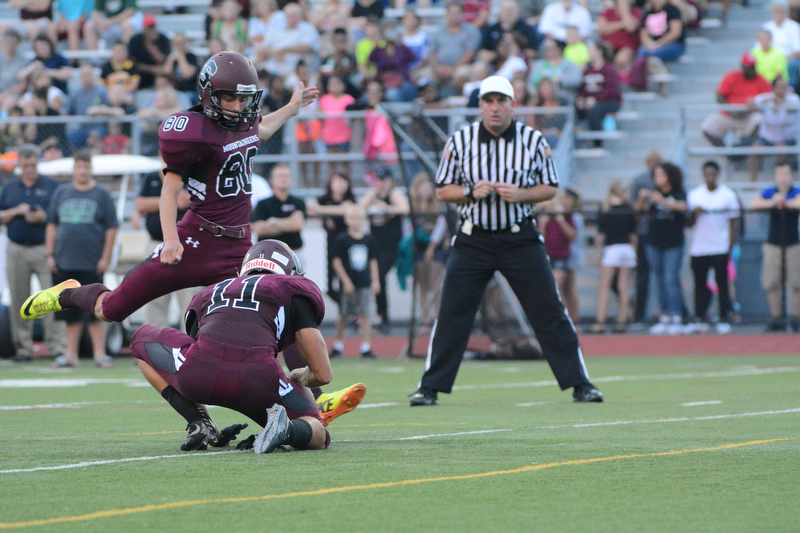 PV’s kicker, Jordan Caffrey was called on to break the tie with a 28-yard field goal attempt. Here, in the photo below, all eyes were on that ball as it made its way toward the goal post. 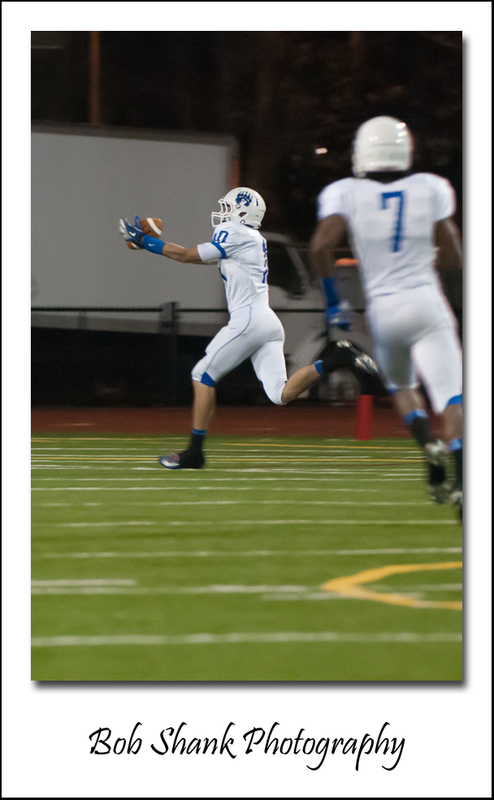 The kick was good and this would be the play that propelled PV to victory in this thrilling rematch! 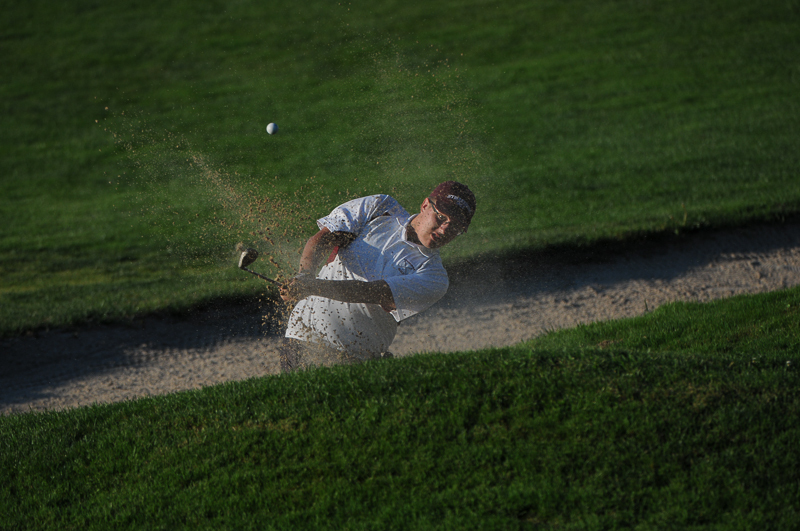 Stroudsburg was not finished though. They put together a final drive with hopes of getting into field goal range before time ran out. But Romeo had other plans. Just as his big reception started off the scoring for the evening’s rematch, an interception late in the fourth quarter stopped the scoring and the final drive. 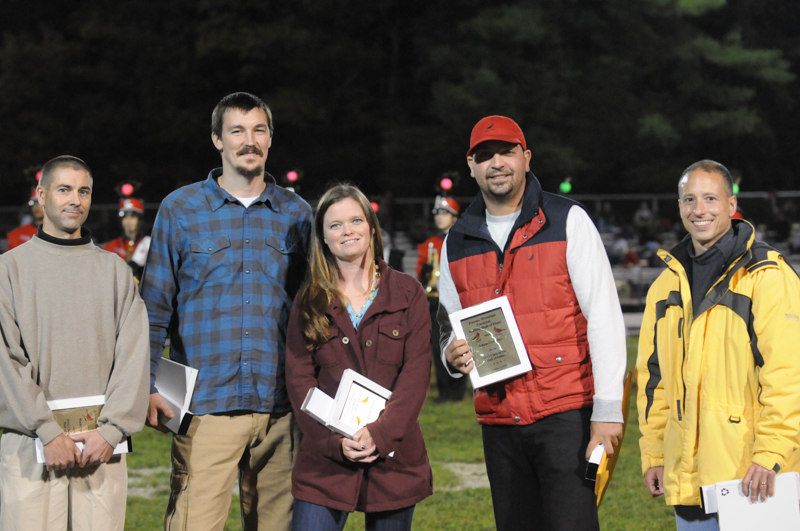 It was then just a matter of running a few plays for PV as time ran out. The scoreboard shows the vital statistics of a game, but it doesn’t tell the whole story. It does not, for example, show the preparation that goes into a game like this, nor does it show the hard work of each player on the line of scrimmage as they battle it out play after play. Still, the scoreboard does indicate the victor, and on this night PV would not be denied. The rematch was a thriller and lets PV continue playing deeper into the playoffs! You can view more photos of this game here. The Scott Kelby Worldwide Photo Walk is scheduled for October 13. You can join us in Stoudsburg for an evening of night photography as we walk around Stoudsburg trying to get that perfect shot with our cameras. You do not need a fancy camera, but if you have one that’s cool. Some creative photos can be captured even with cell phones these days! So bring your favorite camera and join us for a fun night of photography! Bring a friend and enjoy the time together. We will meet in Ann Street Park, which is located at 550 Ann Street, Stoudsburg, PA 18360. The Photo Walk will begin promptly at 7pm and conclude at 9pm. Those who want to hang around and share our photos and experiences will be invited to a restaurant to be announced closer to the date. Click here for more details and to sign up for the Photo Walk.